I have a new dress to show you, I made it from Gerties Ultimate Dress Book, If you remember when I made the Dress for Liz I had a problem with the waist, well it turns out it wasn’t all me not cutting the dress on the fold, there is something completely out with the sizing. my second attempt was a straight size 6 SBA this time I took all the fabric from the side dart. I made a second muslin it was a bit tight, but it got done up I didn’t think any more of it. I made the changes to the bodice pieces as per one of the posts on Gertie’s blog, cut into my fabric and made up the dress. It went together really easy, I basted the zip in tried it on and couldn’t get the zip done up. 😦 miles too tight I took the sideseams apart and used a 3/8 seam allowance a bit better but I still couldn’t breath or sit down once it was done up, then I did what I should have done in the beginning, I measured the pieces, they added up to 26inches, the waist on my supposed 28 inch waist pattern was 2 inches out and that was without ease what was going on here, so then I got the pattern sheet out and measured that and sure enough that was also out 2 inches. I didn’t have enough fabric to re-cut the bodice pieces so I had to steal the extra out of the 4 waist darts, I can now get the dress done up and move about in it, I do need to revisit the alteration to the side seams as one side appears to be a bit wonky but other than that the dress went together very nicely. I had read on the internet that the midriff piece was wrong, but it looks like it could be affecting all the waist sizing. I had already been slightly concerned because the skirt didn’t seem particularly long, I’m 5ft 2″ (and a bit) it come to just below my knees and the bodice didn’t need shortening, though I did take about 1/2 inch out of it in the end. I am concerned though that the publisher hadn’t checked the pattern sheets before printing, especially seeing there is a printing error in Gerties first book and I’m still not convinced on the sleeve pattern for the shirtwaist dress. I have the second book as well but I haven’t made anything from it yet. I am going to make the same dress but use the bodice pieces from sew many dresses so as I can do a direct comparison and give you my thoughts on both books. 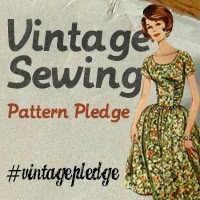 Posted on 20/08/2016, in vintage dress making. Bookmark the permalink. Leave a comment.